Are you on team candle or on team oil? I find that many of my customers favor one team over the other. One group is committed to using the Coventry candles in their spiritual practice, but don’t yet know how to use the oils. The other group are masters of the magical oil and don’t feel the same connection with the candles. We all have our preference for our magical tool kit and I want to blur the lines between the teams just a bit more with our product Wicked Good Energetic Oils. Oils are a wonderfully portable magic. I travel with my energetic oil as well as keep them in my house, on my desk, and in my car. Blending our single scent Wicked Good Energetic Oils make it easy to hit that perfect magical note for a custom spell. The possibilities are limited only by your need and imagination. I love the convenient size. It’s much easier than hauling candles around with me. I have listed my five favorite oils and how to use them. They are both practical and magical. 1 – Cleansing on the fly. Grandma was right when she said a peppermint candy would calm an upset tummy. A cup of peppermint tea can soothe a troubled spirit and peppermint gum is a must after a garlic meal. See the rhythm here? When things are upset or unpleasant, peppermint is the energy you need. I defuse the Peppermint Energetic Oil in the air, to keep the mood calm and clear the energetic crud. Create a Peppermint spray by blending a drop of oil in 10 ounces of distilled water. Shake it up and spray the room. It’s ideal for cleansing overwhelming emotional vibrations from your aura too. 2 – A handshake of power. Shaking hands in a business environment can be a power play. The hand crushing, the limp noodle, the clammy, the never ending, the touch and go handshakes are ways to read the room, but you can be the quiet power that quickly steals everyone’s attention with a bit of Amber Energetic Oil. Rub a little of the oil on your hands. It will your fill your aura with calm, grounded, powerful energy. Next thing you know, your voice and demeanor will follow. 3 – Zen on the go. Sandalwood can just transport you away from your stressors. It’s a calming and uplifting scent that can change your day in an instant. Keep the Sandalwood Energetic Oil on your desk. All you need is a cotton ball, a few drops and few long inhales. You will be ready for that next meeting. (run that scented cotton ball on the edge of the conference table and see if everyone gets a bit zen? 4 – Make more money. Date reminds us of the sweetness of life and vibrates with the power of abundance. Put a drop of the Date Energetic Oil on every bill you spend with the intention of 10 more coming home to roost. Hunting money on the fly! 5- Stick to your goal. Getting your paper done, sticking to your new healthy routine, staying strong in your goal are all empowered by the Juniper Energetic Oil. Juniper helps you stay true to your own resolve and clear out that self-sabotage. Put a few drops on the bottoms of your feet or in your shoes and walk tall and strong throughout your day! Now you are ready to expand your magical tool kit and be both team candle and team oil! 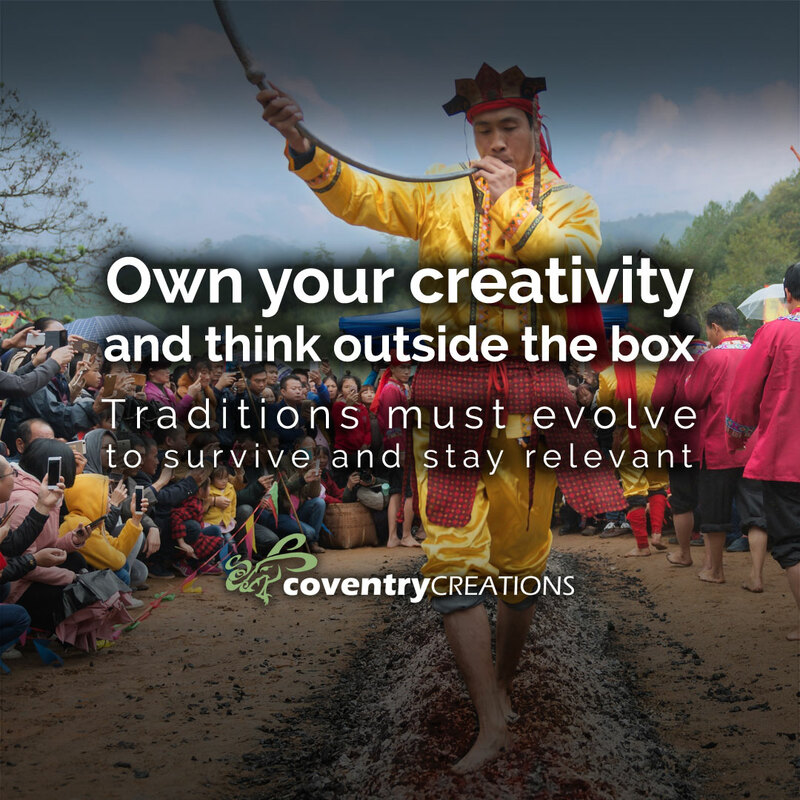 Traditions must evolve to survive and stay relevant. Are you brave enough to be part of the evolution? The foundation of tradition is critical. That is the experience and wisdom of those who inspire you, of course understanding the foundation of your spiritual patch brings you stability to explore further. Foundations can be the stability or they can be the limitations. I like to look at the foundations of my spiritual path the requirements of the age and culture of those who crafted that path. The magical needs of the hearth witch of the 1500’s is not the magical needs of today. I don’t even have a hearth, I have a furnace and central heating. Thank goodness that the hearth witch of long ago tested her spells and paved the way for me. Now I get to pave the way for that magical practitioner 100 years from now who may stumble across something I tried and succeeded with. Who knows, they may have to figure out how to do a candle spell in an age where paraffin candles are no longer available. I tell you, my sister in the future, grab the idea and the spirit and make it your own. In every class I teach I remind my students that someone and sometime had to decide what magical uses each plant, rock, or animal has. If they can decide, so can you. Someone decided that red was for love and someone else decided red was for war. Each of these magical practitioners had a strong feeling about their definition and they had to have some type of success with it to validate their decision. That is how tradition is built, trial and error, experience and myth, results and cautionary tales. This is also how you can build upon your own tradition. When I started making candles for fun, I didn’t agree with the traditional recipes and colors. I read, learned and did my own trials to come up with my candles. I even changed the color of protection from white to black. I felt that black would pull in all the protection you would need and build a stronger fortress. This was not the tradition of any of my teachers and many initially refused to use a black protection candle. I stuck with it anyway. Now I read in some of the newer books on magic that black can be used for protection. I was the decider of my own tradition and others decided that they agreed. We get the best of both worlds, we get the strength of tradition and we get energetic pop of creation – use them both and be the magic maker. Don’t forget to sign up for our newsletter here for more Coventry magic delivered right to your inbox. Creating endless love starts with you. ‘Self-care’ is a buzzword in the conscious living circle. It’s a reminder that after we leave the nest our health and happiness is all on us. But, what does self-care look like? How do you know when you’re doing it? How do you know you’re doing it right? Let me tell you a little secret: Self-care seems like it’s HARD work, yet it doesn’t have to be. It’s your own attitude can turn this from a laborious chore to a labor of love. For many of us, self-care is a journey fraught with obstacles. Those obstacles could have been born from the emotional trauma of trying to “fit in”, being betrayed, fighting, and all the resulting anxiety and depression. The list could be long, but you can chose to not allow those obstacles to stop you from growing. Self-care = recognising you need to love yourself. Start your adventures around love in your own backyard with self love, before you invite anyone to the party. Okay, okay this list seems daunting. Self-care goes way beyond a visit to the spa once a week, or picking up a sweet treat at the local fruit market. Sure it’s a part of it, yet a very small part. Don’t get me wrong, I love a huge slice of Tiramisu as much as the next girl, and I will treat myself from time to time. Yet, a piece of Tiramisu will only make me happy in the moment. It’s temporary joy, it fades after the cake is gone and then maybe a little sadness kicks in. Self-care is long-term and continuous self-care becomes self-love. Love of self increases the ability to give and receive love. It is all reciprocal: what you put out you get back. Did you read number 5 above and cringe? Let me tell you another secret: Love and magic both come from within. In order to attract love, you first must love yourself. Most people get into magic to find their soul mate. That is usually based on believing they need someone to make them feel loved and whole. Have you ever thought about using magic in supporting your journey of self-care, so you can feel loved and whole as a person first. 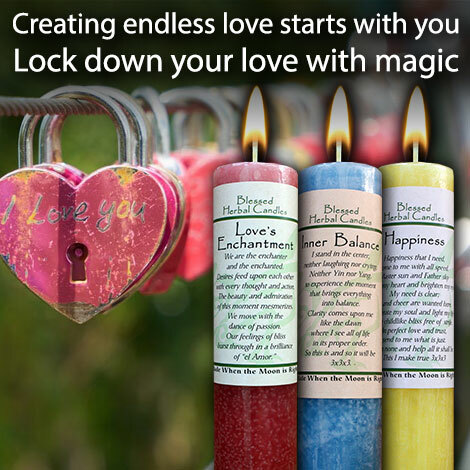 Start your self-care practice by placing Blessed Herbal Love’s Enchantment, Inner Balance, and Happiness candles in candle holders from left to right. As you light the Love’s Enchantment say, “I AM love. I am the loved and the lover. My love endures beginning within me.” Stand or sit in quiet feeling love radiate from your heart and surround you. Next, light the Inner Balance candle saying, “Love is my inner pendulum. It keeps me centered and balanced.” Stand or sit in quiet and imagine a pendulum swinging to and fro and coming to the center and being still. Finally, light the Happiness candle saying, “As a love-bearing and centered person, I create happiness and joy in my life.” Stand or sit in quiet imagining a scene from nature that makes you smile, whether it is watching the sunrise, or gazing at a full moon. Now play some music that makes you want to dance and sing along. Dancing and singing raises our vibrations and makes us smile! Burn the candles every day at the same time until they burn out. Now get working on that list and know that you are magically supported. Remember, if you keep your magic close with a daily practice, it will keep you close in its effectiveness and speed. Keep living the magic, Jacki. 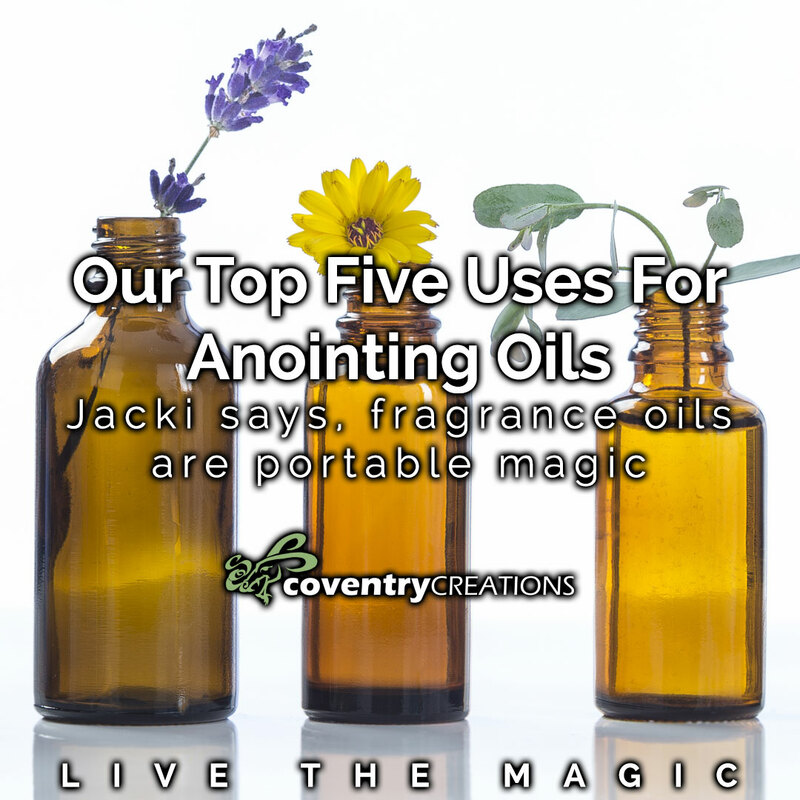 Live the Magic with Jacki Smith through her blogs, books, and products here. We hear the terms: witch’s familiar, magical familiar, spiritual familiar, which all relate to an animal who you are esoterically connected to, but what we need to understand is that your magical familiar, or whatever term you identify with, is an actual living animal. Most of us were introduced to “magical animals” through movies, television programs, or even books. A Witch’s Familiar or animal guide was believed to be a supernatural entity that would assist witches in their practice of magic. This makes complete sense as there are many magical deities that are depicted with specific animals along with the stories that are told about them: Athena is shown with an owl, Anubis with a jackal, Ma’at with an ostrich, Bast with a cat...the list is long. Yet, the witch is always shown with a black cat which is perpetuated in various media. So how do you find YOUR familiar? 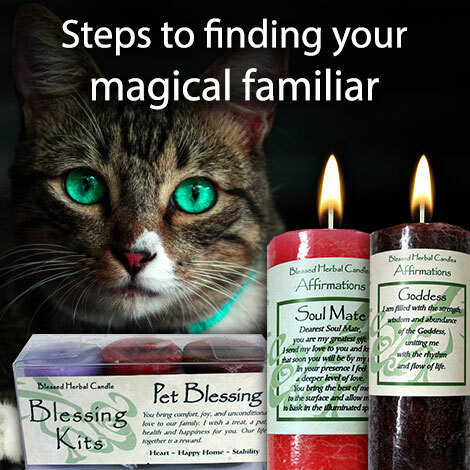 -Arrange the Pet Blessings Blessed Herbal Blessing Kit in votive holders on the left, right and in front of the Goddess Affirmation candle. -Repeat this intention as you light the Goddess candle and each of the Pet Blessing kit starting on the right and moving clockwise. -Allow the candles to burn as you settle into yourself. Pay attention to your senses and your thoughts. Once you have a clear picture of your familiar extinguish the candles. Burn the Soul Mate candle daily for two hours until the candle burns out. Hold the patch to your heart and repeat this same blessing. Spend time communicating, petting and loving your familiar, strengthening your connections and magic. Remember: A witch’s familiar is grounding, energizing, protecting and comforting. This shows us that all pets are magical in their own way. A magical adept knows that a familiar is their magical partner and brings a unique essence and depth to their magic. Wear this patch proudly if you pet brings a unique magic and love to your life.